To maintain and assure quality, there are specific standards that apply to these spaces and guide the process of constructing and operating the rooms. While adhering to these requirements makes designing and constructing a cleanroom more complex than conventional construction projects, the standards serve as a blueprint for the successful completion of a cleanroom that will meet the exacting demands of the end-user. 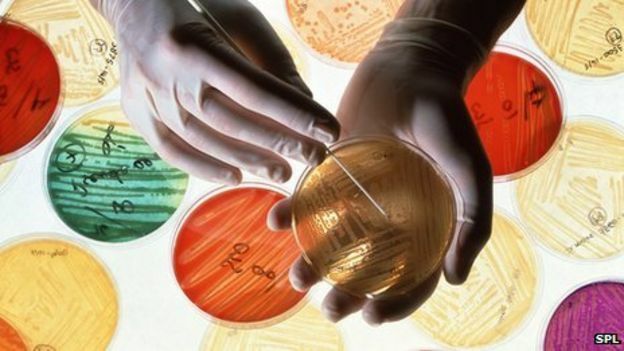 Currently, many different methods have been developed for subspecies typing of Staphylococcus aureus. However, there is no “ideal” one because of its disadvantages and thus there is no commonly accepted guidelines for the selection of the optimal typing method for epidemiological investigations. The aim of the study was an in silico comparison of widely used typing methods, including Multilocus sequence typing (MLST), Staphylococcus aureus Protein A (spa) typing, Pulsed-field gel electrophoresis (PFGE), Multiple Locus Variable-number Tandem Repeat Analysis (MLVA) and whole genome multilocus sequence typing (wgMLST), in terms of discriminatory power and coefficients congruence. Quantitative assessment of discriminatory power and correlation of five typing methods: wgMLST, PFGE, MLST, MLVA and spa typing was performed, by targeting the different sites of the Staphylococcus aureus genome (which had evolved at different rates). One of the most detailed genomic studies of any ecosystem has revealed an underground world of microbial diversity. The research has added dozens of new branches to the tree of life. The bacterial find comes from scientists who reconstructed the genomes of more than 2,500 microbes from sediment and groundwater samples collected at an aquifer in Colorado. The scientists netted genomes from 80 percent of all known bacterial phyla, a remarkable degree of biological diversity at one location. They also discovered 47 new phylum-level bacterial groups, naming many of them after influential microbiologists and other scientists. And they learned new insights about how microbial communities work together to drive processes that are critical to the planet's climate and life everywhere, such as the carbon and nitrogen cycles. Between the 47 new bacterial groups reported in this work, and 35 new groups published last year has led to a doubling of the number of known bacterial groups. One of the world’s largest concentration of reindeer is to be found in the Yamal Peninsula in northwestern Siberia. A new report presents worrying evidence that the reindeer are threatened with starvation. In the region of Russia, hundreds of thousands of reindeer are to be found. Many are herded by the indigenous Nenets people. For 2016-2017 a new report suggests that many of the reindeer are threatened due to a scarcity of food. The report comes from the International Union for Conservation of Nature, and it has declared the reindeer to be vulnerable. Since 1990 there has been a steady decline in the population, with a 20 percent decline (around 80,000 animals) over the past twenty-five years. This is due to scarcity of food and the root cause is climate change. The largest decline occurred in 2013, when 61,000 reindeer starved to death on the peninsula. This occurred due to atypically thickly layers of snow and ice blocking and obscuring access to food - lichen and other vegetation. Warming → Sea ice decline → Increased precipitation and winter temperatures → [Rain-on-snow] events → Reindeer mortality. Essentially, warming temperature causes the melting of ice, which leads to high levels of evaporation and humidity. These temperature effects cause increased rainfall. The rain soaks the snowy ground, and when this is followed by a fall in temperature, the snow freezes leading to a thick layer of ice forming. The layer can prove too thick for the reindeer to smash through. The concern is that a similar event will occur this coming winter, based on climate predictions. This is based on reducing ice in both the Arctic Sea and the Kara Sea, as collated by the National Snow and Ice Data Center, which is linked to the University of Lapland in Finland. Many key cellular processes rely on the physical interplay between biological components to perform functions. The "parts list" in these processes is similar: Microtubules, semi-rigid tubes of protein, can serve within the cell as scaffolding, roadways, and a building material for machinery; some proteins serve as fasteners, binding and releasing other materials; and motor proteins use chemical energy to push and pull materials along microtubules, or move the microtubules themselves. To form the mitotic spindle, two organelles called centrosomes move into position on opposite sides of two identical sets of chromosomes massed near the center of the cell. From each of the centrosomes, a dense network of microtubules is assembled, reaching toward and around the mass of chromosomes. Some of the microtubules connect to the chromosomes, while others connect the two centrosomes, forming a cage around the chromosomes. Ideally, microtubules from each centrosome connect exclusively with one of each of the chromosomes in the set. Then the microtubules -- aided by proteins and motor proteins -- begin to shorten and move, pulling the chromosomes toward the centrosomes, until the two sets have been separated. To read about research associated with this, see the Rensselaer Polytechnic Institute (RPI). Princeton researchers have shown the mechanics of how bacteria build up slimy masses (biofilms), cell by cell. When encased in biofilms in the human body, bacteria are a thousand times less susceptible to antibiotics, making certain infections, such as pneumonia, difficult to treat. At first, the bacterial colony expanded horizontally on the given surface in the experiment. As each cell split, the resulting daughter cells firmly attached to the surface alongside their parent cells. Squeezed by increasing numbers of offspring bacteria, however, the cells at the heart of expanding colony were forced to detach from the surface and point vertically. The bacterial colony thus went from a flat, two-dimensional mass to an expanding, three-dimensional blob, all held together by gunk in the developing biofilm. 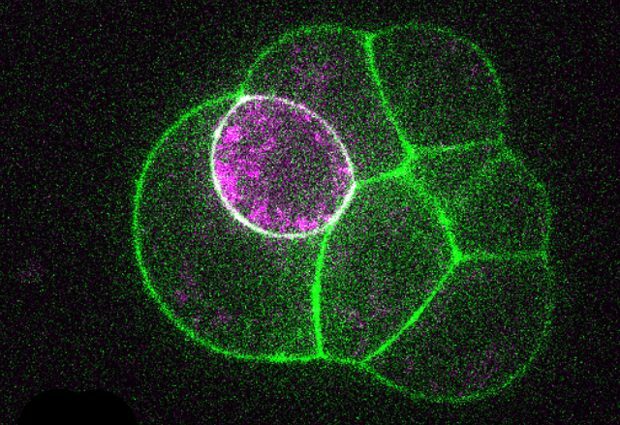 The Princeton team looked deeper into the genetics behind this cellular behavior. A single gene, dubbed RbmA, is key to behavior in which new cells connect in such a way to develop a three-dimensional biofilm. When the researchers deactivated the gene, a big, diffuse and floppy biofilm formed. When RbmA performed as normal, though, a denser, stronger biofilm resulted as the cells stayed linked to each other. Thus, RbmA provides the biofilm its resilience, providing insight into a potential Achilles heel that could be targeted for therapeutic intervention. Ongoing work is now measuring the physical forces experienced by cells uplifting at the biofilm's center so the overall mechanics can be precisely worked out. The class of chemicals characterized as biocides are used in all parts of society from home to hospital, to farms and industry. The presence of biocides selects for genes in microorganisms that can protect against their lethal effects. These biocide resistance genes are often the same genes as antibiotic resistance genes (i.e. cross-resistance), or they can be co-located on plasmids, for example, which means when biocides are present the microorganism will also co-select for antibiotic resistance genes (i.e. co-resistance). “The problem with antimicrobial resistance (AMR), globally, is the combination of: 1) increased prevalence of antibiotic resistance; 2) rapid spread of AMR due to global travel; 3) antibiotic misuse; and 4) too few new antimicrobials in development. National, regional and global AMR Action Plans have been drafted to tackle many of these problems. Thorough reviews, such as the O’Neill AMR Reviews, provide a useful overview of these challenges and some mitigation measures. However, symptomatic of the O’Neill Reviews and AMR Action Plans is their under appreciation of the role that the environment plays in the selection, spread and transmission of AMR. 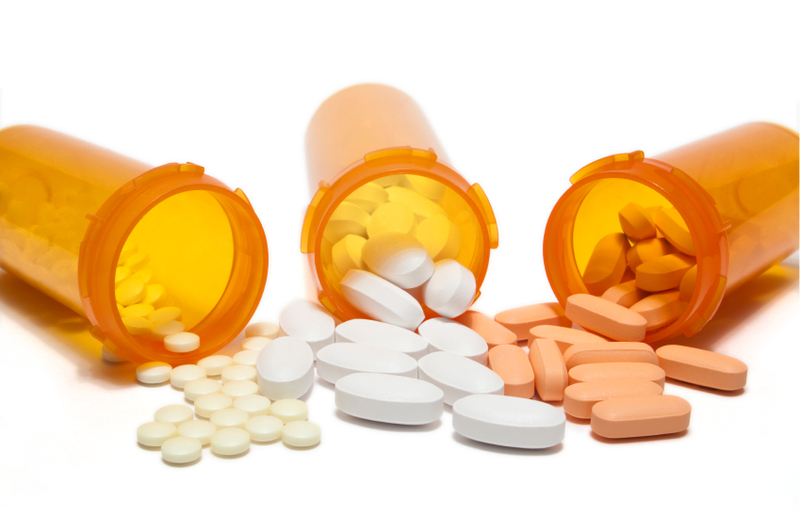 Discussions of the environment are typically limited to the pharmaceutical manufacturing plants as a source of antibiotics and the role that sewage and farm run-off can play in dissemination of antibiotics. The discussions on these issues are superficial and narrow in scope. The full post can be accessed here. This book looks at many of the traditions of Christmas and takes an amusing, sideways look st the science behind Christmas. Just how fast will Santa need to travel to deliver gifts to all the children? Where did tinsel come from and is it safe? Why do reindeer have red noses? And more! Tony Cundell has written an important article on fungi for American Pharmaceutical Review. In the article, Cundell reviews fungal isolation media and enumeration methods for cleanrooms, as well as identification strategies. Microbiologists and technologists have joined forces to come up with a rapid and easy-to-use method to detect Salmonella in food such a chicken. The device contributes to contamination control. 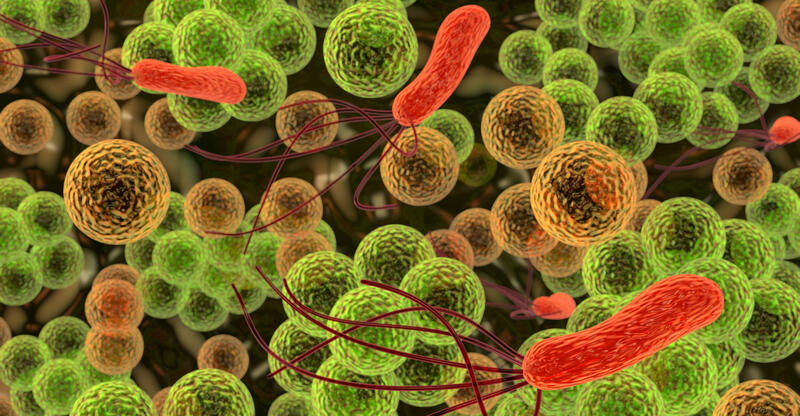 Despite multiple warning about food storage and hygiene, foodborne diseases, like those derived from Salmonella bacteria, show little sign of going away. This means that safety and assurance are as reliant upon regular checks of food preparation establishments and food manufacturers as with good hygiene practices. 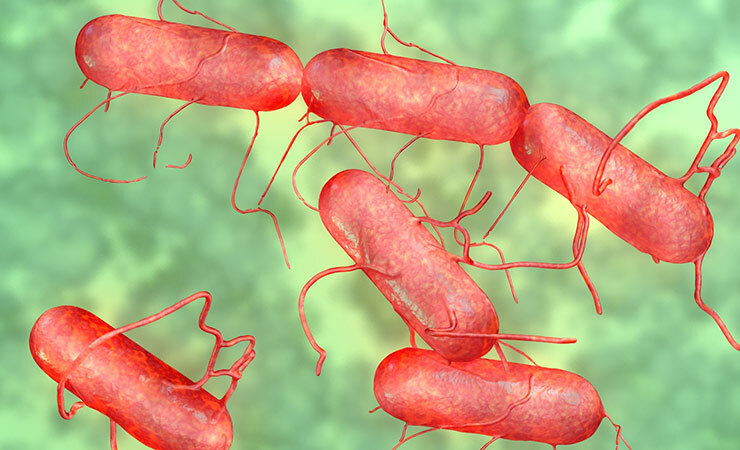 Salmonella is a Gram-negative rod shaped bacterium (the Gram-negative refers to the outcome of a cell staining test, relating to the structure of the organism’s cell wall). To help on the detection front a new device has been developed at the University of Florida Institute of Food and Agricultural Sciences. The new method is a magnetic bead immunoassay. This is a diagnostic immunoassay that uses magnetic beads as labels in lieu of conventional enzymes. The assay involves the specific binding of an antibody to its antigen, where a magnetic label is conjugated to one element of the pair, with detection via a device called a magnetometer. To test the device, scientists artificially contaminated food with Salmonella. These food samples were next tested using Salmonella-specific antibodies combined with a signal amplification technique. The test results showed Salmonella bacteria present after 15 hours. The method therefore showed an accurate detection rate and the results were obtained far more quickly than with conventional cultural methods (which can take up to three days). This means an effective rapid microbiological method has been developed. Longer term it is hoped the method can be used to detect other potential food related pathogens like Escherichia coli. A key aspect of bacterial survival is the ability to evolve while migrating across spatially varying environmental challenges. Laboratory experiments, however, often study evolution in well-mixed systems. Here, we introduce an experimental device, the microbial evolution and growth arena (MEGA)–plate, in which bacteria spread and evolved on a large antibiotic landscape (120 × 60 centimeters) that allowed visual observation of mutation and selection in a migrating bacterial front. While resistance increased consistently, multiple coexisting lineages diversified both phenotypically and genotypically. Analyzing mutants at and behind the propagating front, we found that evolution is not always led by the most resistant mutants; highly resistant mutants may be trapped behind more sensitive lineages. The MEGA-plate provides a versatile platform for studying microbial adaption and directly visualizing evolutionary dynamics. For further details, see Science.